Frances Winston feels that this is a wonderful movie at times, but does get somewhat bogged down by its subject matter. 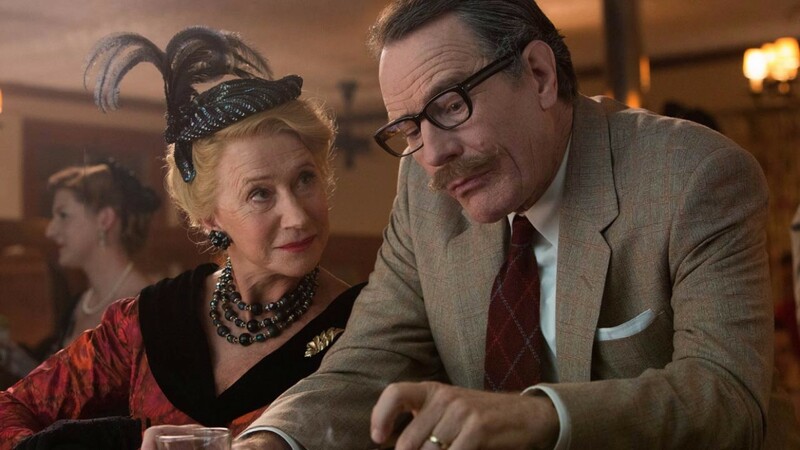 However, Cranston’s performance as Trumbo saves it, making the serious and eccentric character likeable. The true story of screenwriter, Dalton Trumbo, is stranger than anything he could have committed to the page. As a supporter of the communist party in 50s Hollywood, he found himself blacklisted following the McCarthy Trials. Sent to prison and vilified by his peers, his once-glittering career seemed over, but Trumbo was not a man to take something like this lying down. Following his release, he came up with an ingenious way of continuing to work and – more importantly- make money to support his family. Trumbo got another writer to pitch his work as his screenplay, and in no time at all he was writing hit movies again, and even winning Oscars. He also started writing for a small B-movie studio under a pseudonym, and helped other people similarly affected by the blacklist by engaging them to work there. Of course the blacklists were eventually lifted, and Trumbo did eventually receive all the accolades due to him, perhaps thanks in no small part to Kirk Douglas insisting that he got credit for his writing work on the epic, Spartacus. However, the echoes of the era loomed large for many years, and many people lost their livelihoods as a result. Here Trumbo is played by Bryan Cranston, who manages to make the somewhat curmudgeonly Trumbo actually seem likeable! Revelling in the writer’s eccentricities – such as writing in the bath – he manages to find the humour in what could have been a very serious character in other hands. He is ably supported by Diane Lane as his wife, Cleo, who imbues the character with a strength alongside a sense of despair as their lives fall apart. Louis C.K. as Arlen Hird (who is actually a composite character) is a revelation. Best known for his comedy, he manages to play it straight here, and conveys the gravity of his character’s situation, without resorting to parody or black humour. In fact, one of the weakest performances (it pains me to say because I love her) comes from Helen Mirren, as legendary showbiz gossip columnist, Hedda Hopper. While Hopper was indeed a completely over-the-top individual, Mirren’s performance is just slightly too much the wrong side of caricature to sit comfortably. Aside from the performances, Trumbo boasts some wonderful cinematography and editing, which really transport the audience back to the era. However, at times the script wavers and the pace drags. Apparently quite a bit of dramatic licence was taken with the facts, so this may be the cause of the latter, but it is unfortunate, whatever the reason. Another flaw is that it shamelessly defends communism rather than taking a neutral stance, which would allow the audience to make up their own minds. In trying to make a glossy biopic about a very non-glossy individual, Roach has diluted some of the key facts, and somewhat deified his subject matter, all of which drags this movie down. While it is wonderful at times, it does get far too bogged down by its subject matter as it plods along. It is completely saved by Cranston though (who has deservedly been nominated for an Oscar for the role) whose performance should ensure that it is not just movie historians and geeks who flock to Trumbo.